2015 will be a year long remembered, it has seen my first Eve Fanfest and trip to Iceland and it witnessed the barrier finally broken between fan based art and CCP with the launch and sale of two complete poster series on QMx. A rather historic turn of events, not without its share of problems with international shipping costs, but certainly a huge step in the right direction. A direction I continue to hope improves significantly in 2016. There isn't much more I can do personally to ensure that it improves, my hands are rather tied in that regard. But I continue to be available to do whatever I can to support whatever direction CCP ultimately takes. That is really all I can do. The ball is securely in their court. Fanfest was an incredible experience and I highly recommend it. My wife and I had an insane rollercoaster ride from the moment we landed until we left exhausted and wasted. But I wouldn't have changed a thing. We got to meet and hang out with tons of friends, both new and old, meet and talk with bunches of CCP peeps, I got to do a player presentation and a round-table, I was on Eve TV with Guard and Niden, and I was fortunate and honored to have dinner with CCP Seagull and her husband. Not to mention the reaction CCP Mimic blessed me with when she realized it was me she was talking to, all of which is something I will never forget. This year I won the "Decorate the Offices" contest and my mural is now hanging somewhere in the vast CCP corporate behemoth building. That was a great honor and I look forward to getting to see it once we are back in Iceland this April. I also got some seriously awesome loots from the contest. It wasn't all sugar and roses of course, this past Summer also saw the take-down of our video game Drifter Wars shortly after it was released. Once again the project was intended to present an opportunity for CCP Legal to address an open question regarding EVE IP and application based opportunities that are currently being exploited by others. And which will be in the future. The glacial pace of these changes and clarifications continues to be one of the most frustrating parts of trying to work with CCP. Nothing happens quickly. I was hoping to have some answers by the end of this year, but that doesn't look like it will happen. In 2015 Stay Frosty and A Band Apart continued to thrive and grow. Over the Summer we played around with taking Sov in a couple of Null Sec regions. Our experience taught us many things, the most important of which is that transforming a Pirate based Alliance into a Sov Holding Alliance doesn't happen quickly. Even for lolz. We had fun though and that is all that really matters. We also participated in our very first Alliance Tournament and despite not winning a single match we learned a lot and will do better next year. I remain rather unhappy about our showing frankly. Next year we shall do better. All of our pilots will be more experienced and more skilled, which will only help the planning and application of doctrine. Ya gotta start somewhere. I would really like to win the AT someday. Might as well be 2016. My wife started playing Eve when we got back from Fanfest, which has to be the ultimate highlight of the year for me. She doesn't get to play much these days, our family situation is rather intense right now, but she is my main counsel in all things Eve. She keeps up with the Meta even more than I do and lets me know when I should step in or step away. It is rather awesome. And I can't end the memories of 2015 without mentioning the most incredible moment of all. A day I remain humbled by. I found myself up against a rather hard wall and did something I have never done before, I asked for help. It wasn't easy for me. But within nine hours the generosity and compassion of our great community overwhelmed me and provided a solution to get over that wall. I will never be able to thank you all enough times, or in enough ways, to express my sincere and complete gratitude. Every day when I sit down to work, to write, to draw, to play, I thank each of you in my heart. And I am totally not just making that up, I really do. Thank you. So many other things happened in 2015. I'll have another post tomorrow to catch up on the greater community and the actual game itself. I remain hopeful that 2016 will be an even better year for all of us. Click to download print quality sizes! 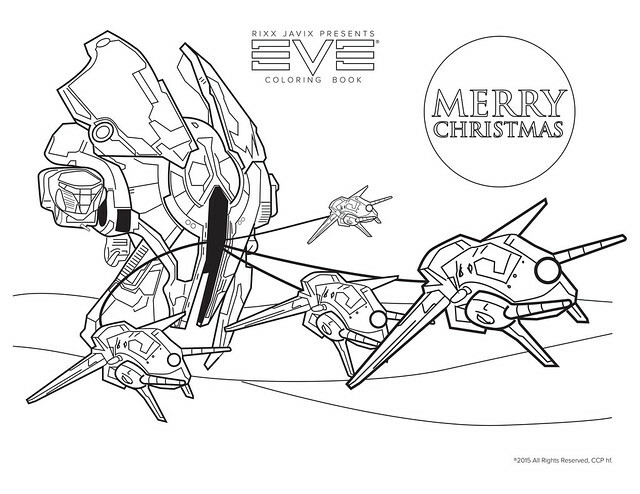 After reading CCP Mimic's nice words about the Coloring Book in today's Happy Holiday message from CCP, I realized that I hadn't added any new pages in a long time. Not to mention any "holiday" themed pages! So I went straight to work and I immediately knew what I needed to do. A bunch of Hobs pulling a Tristan! And yes, each of them has a potentially red nose - cause all Hobgoblins are special. As everyone nose! Its all for a good cause, read more about Care4Kids here. I've recently become aware of a strange trend on-line among writers of culture. I'm trying to stay away from any specific links or examples, as I try and see things in a more general over-arching fashion. And I don't want to call anyone out about something specific, as I don't know anything at all about their individual background or approach. All of that being beside the point anyway. The point is essentially a simple one, lack of knowledge, experience, or interest in historical culture milestones being treated as a virtue or point of pride. An actress who doesn't know who Rock Hudson is. A film-writer who hasn't seen any of the Star Wars films. An art reviewer who doesn't know the works of Jackson Pollack. I could go on. All of these examples are ones I have run across lately. The thing that unites them all, beyond just the sheer ignorance, is the attitude in which they were presented. As if such gaps are sources of pride. A choice that had been made to purposefully ignore obviously important and significant history, within their own field of interest. Before I go any further, let me be clear. I'm not saying that everyone needs to experience, know, learn, see, and hear everything. That would be silly and also impossible. I am saying that a musician who doesn't know who the Beatles are, is purposefully being ignorant. And such a choice, while totally their right, is not something to be proud of. It is clearly a sign of ignorance and an embarrassment for that musician. I'm a huge film fan and I have never sat thru an entire viewing of "Gone With The Wind" (as an example) and I probably never will. But that doesn't mean I don't understand the significance of that film, the time in which it was created, and the impact it has had since. It is interesting to contemplate as a trend, if it is indeed one. From where does such an attitude about the past originate? Is it a reaction to the overwhelming pace at which new information is being presented to a modern generation? Have we begun to experience the results of max-saturation? Is this a lack of processing power in our minds? These are obviously much bigger questions than I am attempting to answer myself. I liken it to the exuberance of pride un-educated people take when pushed into a corner on a subject to which they have no knowledge. It calls to mind a recent case in which a young man ended up being killed by a Police officer simply because he was convinced, beyond a doubt, that he knew the law better than the Officer. I remember the case because it stood out to me as an example, not that ignorance is potentially harmful (duh! ), but that pride in your own ignorance is harmful. Its one thing not to know something, we all have blanks in our knowledge base, but it is another to cover those blanks with a false sense of pride. There are no unexpected virtues of ignorance. But perhaps all of this is nothing new. Perhaps it just rubbed me the wrong way this past week because I bumped into a half-dozen examples. Not knowing something is not a problem. Ignorance itself is simply a hole waiting to be filled with knowledge. We all have them. The point really is the way in which you choose to deal with your own lack of knowledge. Covering it up with baseless pride is never the right choice in my humble opinion. Try to keep up. The world just keeps turning. And special thanks to all the players that have chosen to play with us in Stay Frosty and in A Band Apart. You are the greatest and the reason I continue to log on every day and look forward to sharing, hearing and creating new challenges with you inside of New Eden. Our best years are ahead of us as we continue to grow, expand, and influence the space we fly in. And I can't imagine a better group of people to do it with than you. Its funny now, but believe it or not there was a time when people would criticize me for not being able to stay the course in Eve. Early in my Eve career I did jump around a bit, although the careful observer would notice trends in those moves that had more to do with Wars and opportunities for Wars in Null sec than anything else. What it all was is easy to explain, I was searching. Looking for a place to hang my hat, the perfect combination of friendships and opportunities. It wasn't until I found low-sec and those that fly there, that I realized an important truth. Sometimes, if you want a home, you have to build it yourself. So I took everything I had learned, everything that I wanted a Corporation to be, and willed it into being. By sheer force of will Stay Frosty sprang into being over two and half years ago now. I suspected there would be other players that felt the same way I did about playing Eve, but at that time I had no idea there would be so many. Since we formed, hundreds and hundreds of players have passed thru our doors. Some have stayed the course and many have moved on to other adventures, but almost to a tee, they have all stayed within the family. It is not uncommon to bump into former Stay Frosty pilots in every region of space these days. And if you've just had a good fight with someone, look at their employment history, and more often than not you'll find a former Stay Frosty pilot. Soon we discovered some players wanted to take the "Stay Frosty" approach into other play-styles and we formed an Alliance of like-minded Industry, Wormhole, PvE and other corporations. Each built around the same approach to the game. A larger family, interchangeable, sharing, growing, and vital. Truly A Band Apart. Its funny now, but believe it or not there was a time when people would criticize me for not being able to avoid drama inside of Eve. There isn't any drama in ABA or in Stay Frosty, hasn't been since the last drama queen left the Corporation over two years ago. Thats because the "drama" was always from someone else. Oh sure, we have our Corp thieves from time to time. Or drama llamas that try to stir the pot. With a dedicated Open Recruitment policy these things are bound to happen. Just this weekend someone tried to troll the corporation by losing a Panther in HS to a war. It is impossible to troll us. It is impossible to hurt our killboard. It is impossible to steal enough to hurt us. We are Pirates and we laugh at you. That is what we do. There is no drama because we do what we do. Because it is about people more than about politics. When someone comes to me and asks if they can try something, I always say yes. Want to be an FC? Go and FC. We'll try our best to help you. Want to invade Null? Ok, make it happen. Individual Freedom is what we are all about. Alliance first, always have your friends back and always dare to try. No one will make fun of you for failing, or kick you for trying, or yell at you for taking chances. In fact, we support the bold. 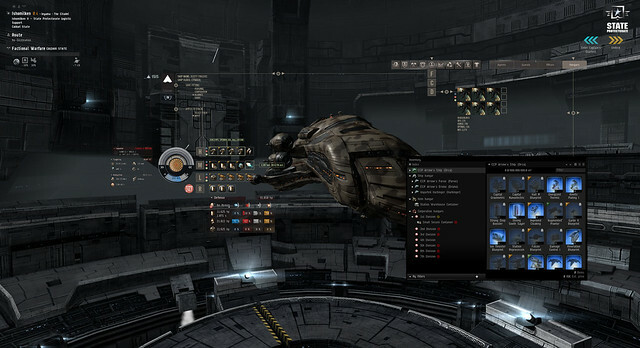 There is a casual, friendly, exciting, play-when-you-want, do-what-you-want alternative inside of Eve. There is a place where you can try new things, find good fights, fly with friends, learn to PvP with the best, hardest, meanest, most fun loving Pirates. And our recruitment is ALWAYS OPEN. You put an app in and you get accepted. The rest, as we say, is up to you. In so many ways the Star Wars films have always been relatively review-proof, say what you want about them (especially the original trilogy) but you either enjoy them or you don't. They have never apologized for being what they are, Space Opera in the grand pulp tradition. They borrowed from so many genres that they sort of invented their own genre, neither truly science-fiction nor fantasy - but something that combined elements from across many pieces of art, nostalgia, pulp-science, Samurai films, and more. That is the strength of Star Wars and why it has resonated across the decades. And why it managed to survive the miss-steps of the prequel trilogy. This is not an easy task, just because we understand the DNA of a thing, doesn't mean we can replicate it. Many have tried and most have failed miserably. So how then does one start another chapter and take that DNA in a new direction, while maintaining a connection to the past? It is, and was, a very tall order. I freely admit to having my doubts that JJ Abrams was the right choice to make that leap. It helped that Kathleen Kennedy was involved, it helped that Lawrence Kasdan was brought along to help write the script. Practical effects, John Williams, the news about the old cast returning, everything seemed to be pointing in the right direction. The band, such as it could be, was back together again. Would they be able to pull off a nearly impossible task? Could they bring magic back into Star Wars? I'm here to tell you that they nailed it. 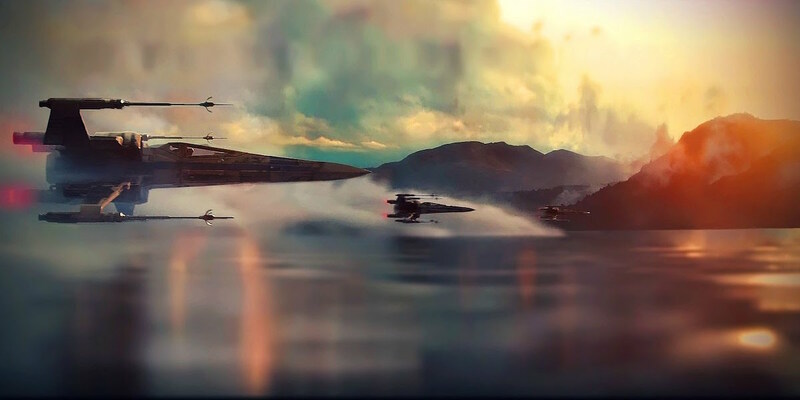 Star Wars The Force Awakens is more than worth the price of the ticket, in whatever format you choose to see it. I saw it in 3D on a huge screen and it was glorious. I promised I wouldn't spoil anything and I won't. 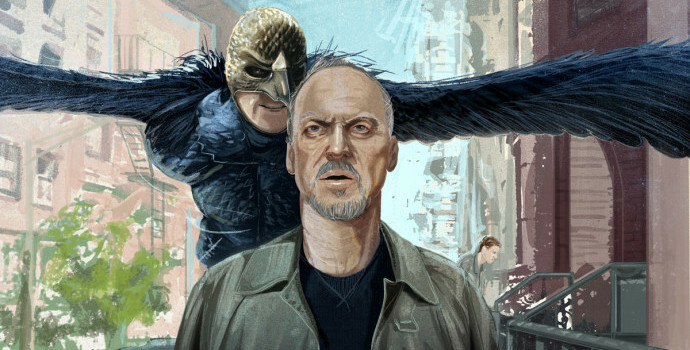 In my opinion if you don't enjoy this film you must be dead inside. Granted it isn't perfect, nothing is. Certainly not the original films. Nostalgia is a powerful force, and the pull is strong. It is difficult to measure a contemporary expression against the power of that nostalgia, and few things pose that challenge more than Star Wars does. But if you can let go, sit back and let it flow thru you, you'll have a blast. I promise. I did. I'm going to see it again over Christmas break and I'll probably write more thoughts about it after a second viewing. I left the theater today with that old Star Wars feeling churning in my guts, and a strong urge to see it again as soon as possible. That doesn't happen much these days. And it should. I'm very excited about where this new adventure will take us. And really looking forward to the stand-alone films. Exciting times. PS: Let's try to keep the comments SPOILER FREE ok? 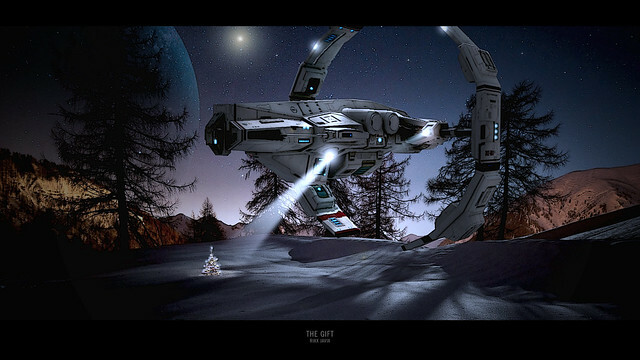 It has become a holiday tradition over the years, my annual holiday themed Eve Wallpaper. So here is this year's entry just for you. I didn't set out to make this one, it just sorta kinda happened in a very weird way. Lately I've been trying to carve out some time each day to practice illustrating, painting, and whatnot on my new computer. Mostly I've just been exploring and trying out a whole bunch of new things, seeing how they work, and what can and can't be done with them. 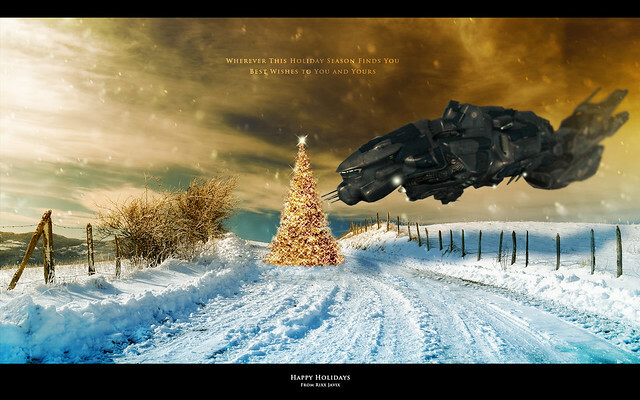 Yesterday I had the bright idea for a new illustration that would feature an Astero discovering a Christmas tree on an asteroid. Which sounds awesome right? And it could be. It is also A LOT of work! (lol) Which I don't normally mind, but this is the Holidays and with kid's concerts and everything else going on (like editing an entire book!) time is rather hard to come by. So I adapted the idea instead. I don't think you'll mind. It is, after all, the spirit that counts. 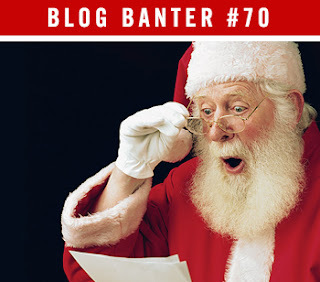 I'm sure I'll have a holiday themed post around before Christmas, so I'll save the mushy stuff until then. Enjoy the Wallpaper. Last year's Fanfest was our first. It was an insanely awesome and incredibly busy first time filled with meetings, dinners, player presentations, autograph sessions, first-time meetings with people I've known in-game for years, lots of beer, lots of "hey you're Rixx!" moments, snow, ice, amazing sights, tours, volcanos and stress. We couldn't wait to go back. It was also a very transformative trip in many ways. My wife became an Eve player during our trip and signed up shortly after we got back. And she has embraced the game and the "community" in the months since. If anything, she is just as excited about returning as I am. Luckily my wife is my secret weapon. She is a dedicated value shopper and has spent an incredible amount of time finding us the perfect and most cost-effective ways to return. There cannot be many people that know everything there is to know about Iceland, but you can easily count my wife among their number. She has done incredible work to make this return trip work for us. So extreme kudos to her. It is a strange thing. I miss it and can't wait to go back. The first trip was such a newbie whirlwind and went by in such a blur, I'm hoping that this trip will benefit from us having already experienced it once. Maybe things will be more "normal" this time around. I miss my friends and can't wait to see familiar faces once more and new faces for the first time. 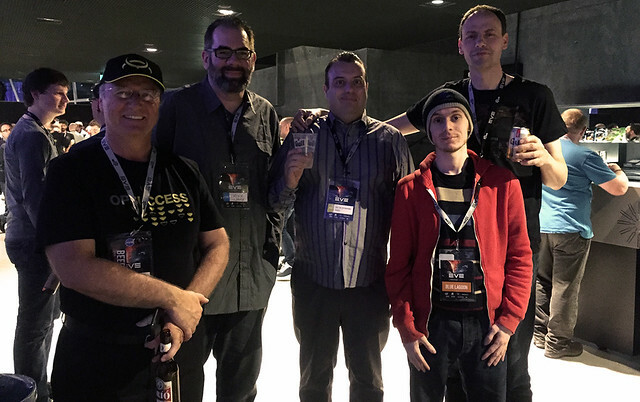 I miss everyone at CCP and look forward to hanging out with them again and meeting many of the new people that have arrived since the last Fanfest. And getting another chance to make Hilmar laugh. I will not fail this time! We learned a lot the first time. So one change we've made based on our previous experience is time. We're going for a few more days this time around. The trip out and back is exhausting. And it isn't the best idea to be awake for over 24 hours when you land, arrive at the hotel, rush over to CCP HQ to meet with CCP Spitfire for a tour, then have dinner with him, CCP Seagull and her husband and then walk back to the hotel in an ice storm to finally crash. And then wake up and have a player presentation, autograph session and roundtable to attend the same day. Not doing that again. So we learned and will be arriving a day earlier and staying two days longer. So we can see more Iceland after Fanfest is over. I hope to have some new projects in my pocket again this year. It is still early and I can't officially announce anything yet, but there are some exciting things in the works. So finger's are officially crossed that everything works out and I can bring even more things to light for the players next year. So for anyone considering attending Fanfest in Iceland in April I encourage you to come. It is an amazing experience and one you will not regret. And I hope to see you there. 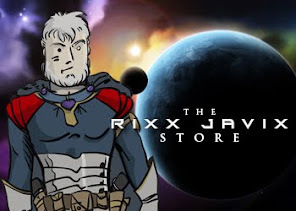 And then you can be the one that yells, "Hey Rixx!!" on the street in an ice storm at midnight. lolz. My studio got an unexpected boost yesterday from my good friends in A Band Apart. Unknown to me, they have been sneaking around in cahoots with my wife to surprise me. It went off perfectly from my end, I had no idea what was going on. Even yesterday when the UPS package arrived. It was the right address but the person's name on the box was not correct. I thought for sure it was a mistake. So what is this thing? It is called a Palette Gear Pro and you can learn more about it on their website. Essentially each module magnetically locks into the others, the black screen module is the anchor, in what ever order you want. Each one is programmable to functions within a wide range of programs. Mostly it works great with Adobe's Creative Suite, but new program support is being added all the time. Even the light color on each module is programmable, to make it even easier to distinguish each module in a dark studio. 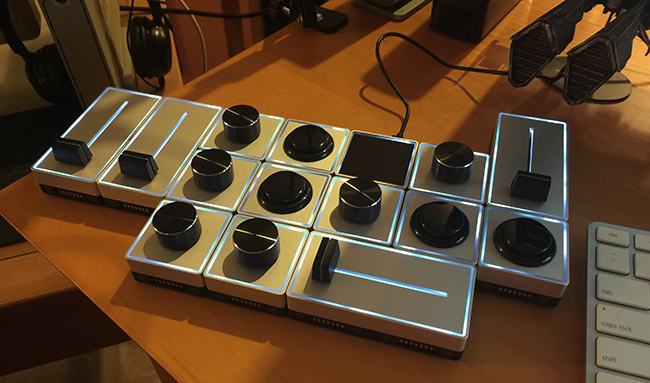 The one on my desk now is the Palette Professional and it comes with 14 programmable modules and the anchor module, all powered thru a USB connection. This cool and awesome thing is the result of a successful Kickstarter campaign. And that is all the technicals. A huge heartfelt and sincere shout of thank you thank you thank you to Ramdar Chinken, Joffy Aulx-Gao and my beautiful and secret-keeping wife for this amazing Holiday surprise. And to everyone in A Band Apart. You have all humbled me once again with your amazing thoughtfulness and caring. I'm extremely proud to fly with you all. The Holidays for our family these days is a time of stress, legal actions and personal struggles. In one surprising act of kindness you guys have brought the spirit of the holidays to life and words fail me. PS: And no, I am not sure if it will work with Eve yet. Looking into it. 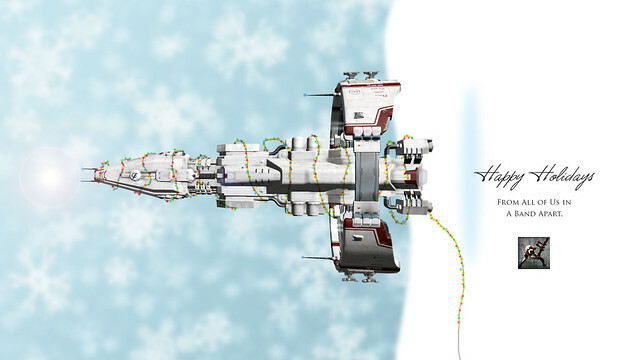 CCP Fozzie kinda ruined this blog post for me. I usually ask for WCS to be banned from the game, which as most people know is just my way of pointing out a bad game mechanic that needs to be worked on, but this year I got the Navy Maulus under my tree. With a built-in bonus to scram strength and range... well, those WCS in your low slots are not going to help you. I love the ship and have been practice flying it around for the past few days, working on fits and whatnot. Yesterday I got eight kills and four final blows (KILLMARKS!!! Another Gooder Eve suggestion btw!) before I hero tackled a Magus and sadly landed right smack on top of him and exploded. Lately it has felt like Fozzie and everyone at CCP had just been reading back over my Gooder Eve posts and saying, "Ok let's do something like that!" Anti-WCS ships, Killmarks, Tactical Bookmarks, Citadels (Battle POS!! 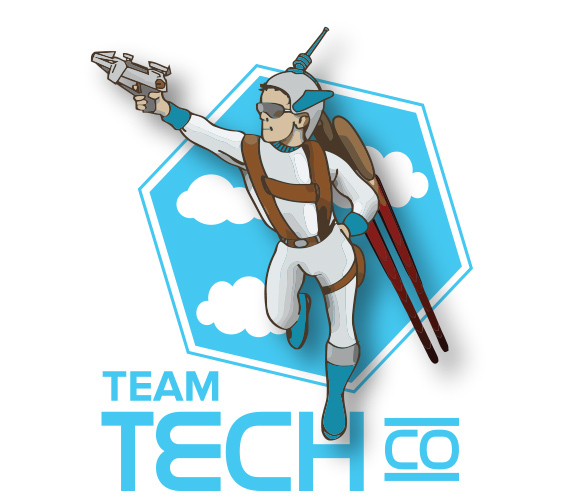 ), Skill Training, Tractor Beams... the list is long. And while the Gooder Eve posts are not always serious, they are always intended to get a conversation started about improving Eve and the experience of playing it. So where does that leave us today? There is no doubt that Eve is better now than it has ever been and it looks to only continue getting better and better in the very near future. So what could possibly make it even better? HATS!!! This one is a no-brainer. 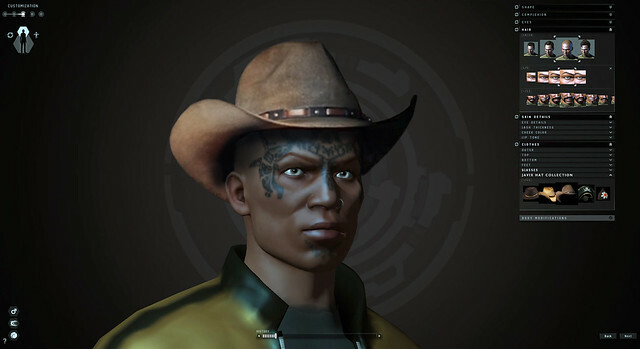 Not only would avatar hats be seriously boss, it would be yet another way that CCP could pilfer our wallets. Everyone wins. 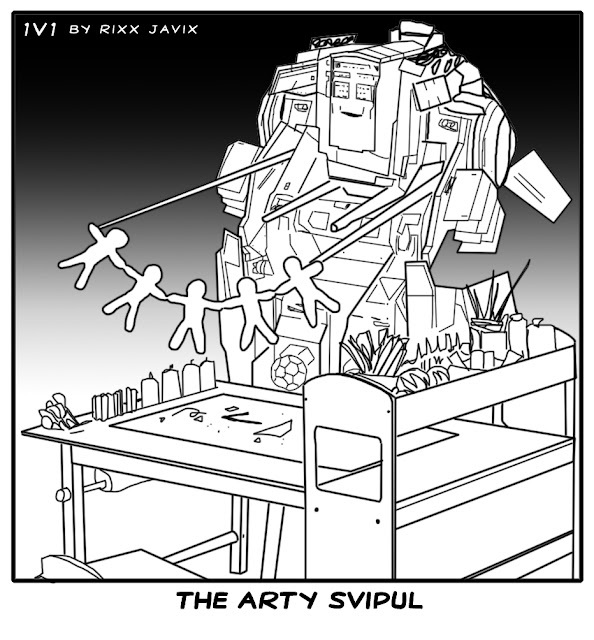 I know somewhere inside the corporate towers of CCP that someone is secretly working on this project. So it should only be a matter of time. Woot!! I also think we should consider taking the Assault Frigate Class and turn it into the T3 Frigate Class. AFs have been squeezed hard between recent balancing and new Dessie additions, not to mention all the love actual Frigates have gotten. They need love and what better way than to make them somewhat modular and role specific? It makes perfect sense and would help save the Class. Do eet!! Seriously though, if I had one wish it would be being asked to come work for CCP and help CCP Spitfire bring the Eve Store to life for Eve, Gunjack and Valkyrie. And then, once inside the machine, I could annoy the crap out of everyone else with these crazy ideas thru legit channels. lolz. Hey, a guy can dream can't he?!? In 1977 I was a few months shy of turning eleven when my parents dropped me and my friends off in front of the local single-screen theater to see Star Wars. I believe it was the first day, but I can't be sure. The theater was packed, the line was around the block. At that moment, standing outside waiting in line, I was a normal proto-geek genius little-league all-star baseball player who was just beginning to realize just how amazing girls are. It would be wrong to say all of that was about to change, because girls got even more amazing later, but when the camera panned down and that Imperial Star Destroyer rolled out of my eyeballs... things changed. Up until that moment genre was just another part of an interesting life for me. I enjoyed reading comics, watching old Star Trek episodes on re-runs, science-fiction, horror, whatever I could get my hands on in a small rural town well off the beaten path. But Star Wars arrived at the perfect moment, the crossroads of development, the turning point between childhood and those creepy teenage years looming on the horizon. Star Wars opened my eyes in many ways. Nothing like it had ever been seen before. That might be a hard concept to appreciate for my younger readers, but trust me, Star Wars on the big screen back in 1977 was mind-blowing. In those days if you didn't see a movie in the theater you might never, ever see it again. This was a real possibility. Only a few movies would get picked up and shown on television and even then they'd have commercials and be "edited for television". (Oh how I hated those three words!!) So I ended up seeing Star Wars that summer about nine or more times, which wasn't that difficult back then, I think it stayed in the theater the entire summer that year. And yes that Christmas was one of the best of my childhood. My brother and I awoke on Christmas morning to a tree loaded with Kenner Star Wars toys, action figures, ships, the works. Between us and all the other kids in the neighborhood I think we had the entire line amongst us all. We spent Christmas vacation comparing our loot takes with our friends. And no we didn't leave a single toy in the packaging! We played them all into the ground, those original toys got used and abused. Star Wars ignited a life-long love of science-fiction, an interest in special effects, filmmaking, editing, and storytelling that continue to this day. The concept art and designs found in magazine stories and books ignited an interest in art and illustration that I continue to explore professionally today. Because Star Wars ignited my imagination in ways that nothing else could have. I was fortunate to see Phantom Menace about a week before it opened. 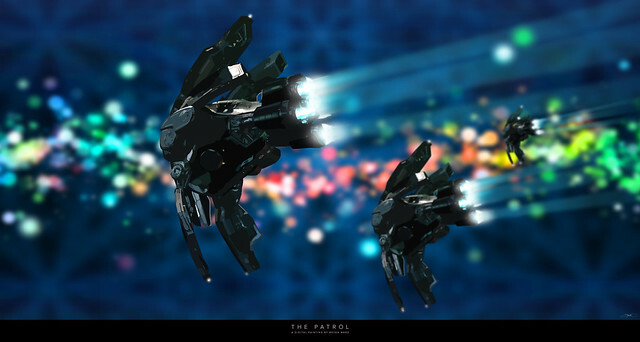 At the time the agency I worked for represented Fox and we often worked the sneak peeks for their films. I took my son to the sneak, he was six years old at the time. He dressed up as Darth Vader and helped me keep everyone in line before the show. I'll never forget him role-playing as Darth and wacking people with his little red lightsabre, all while breathing heavily and trying to be menacing. Despite the problems with the prequels, that moment will stay with me forever. And now I have three other boys who watch Star Wars Rebels and the other shows and movies, and they are all excited about the new Star Wars movie coming out next week. Its starting to feel like this might just become a multi-generational thing that continues well after I'm gone to that hologram Jedi ghost place in the sky. And that's ok. That's good. I don't know how the new movie will turn out. I'm excited for it. Probably grossly over-excited for it. The closer it gets the less adult I feel about the whole thing. I can't help myself. The world has changed a lot since 1977, I've changed a lot since then as well. An entire life-time has passed. And yet, I hope the magic is still there. Maybe, even in this contentious age of ours, it might be possible to feel a tiny bit of that old magic once more. I know this much. 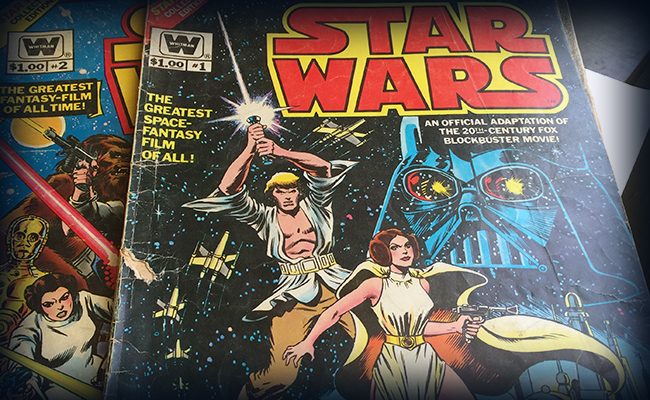 Back in 1977 we all needed to feel a little magic. And I think it would do us all some good to feel it again right about now. Just a little bit would be fine. PS: I think I still have the album (an actual record made of vinyl) that contained the Star Wars story told with a Narrator and the audio from the movie. When we couldn't see the film in a theater my brother and I would play that record over and over again. That is why, even today if I think about it hard enough first, I can pretty much recite the entire first movie from memory. I bet I listened to that poor record a hundred times or more. 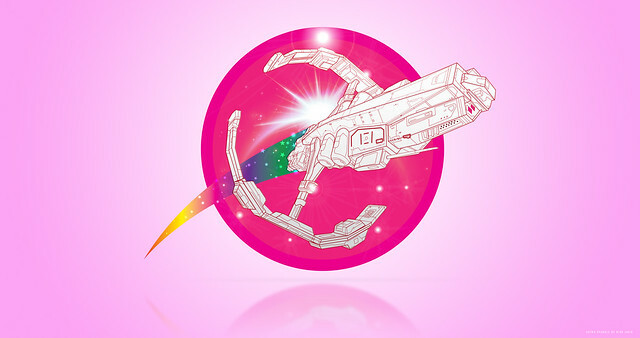 I don't have a link to the forum post, but CCP Logibro's new Dev Team asked for help with a new logo and offered to pay a Plex for it. Heck, I usually do these for free for the Dev Teams, so a chance to win a Plex was something I couldn't pass up. Finger's crossed. Funny story that. The "rocket boy" art was part of the design process for the Brave Newbies Alliance logo from a few years back. I never throw away un-used art, you never know when you might need it. Good to see it finally seeing the light of day. I always get a kick out of imagining the CCP Offices full of my work, it always makes me smile and helps me get thru the day. Fun stuff. Before you read on you should take a moment and read Sion Kumitomo's article over on TMC. I don't normally share links there, but I will make yet another exception for your benefit. So here it is. Someone should really try and talk him out of writing any more posts about something he obviously fails to comprehend. This is two posts lately in which the esteemed Mr. Sion fails to grasp the enormity of his own foot when placed directly into his own mouth. So let me take a moment and clarify a few things in simple, easy-to-understand language. "Let us acknowledge what is actually behind these judgmental, exclusionary statements: attempting to invoke "the community" is a naked political play by people who lack the courage to stand for something on their own. It is a lazy way to elicit the illusion of mass consensus while shouting down opposing viewpoints. We see this same technique in political campaigns worldwide in the form "the nation’s people demand" and such. This is not a novel approach, and it is as transparent in EVE Online as it is in real-world politics." At least he isn't talking about me here, so I will give him some credit. So let me get this straight, when a majority of players (including the vast majority of your own players in GSF/Imperium by the way) refuse to fund your Kickstarter that means they are cowards? Uh, no. That is not correct. Just because you say something doesn't make it true. There is no "illusion" of mass consensus at work here, there is actual real mass consensus at work here. They didn't like the Kickstarter and they refused to support it. Period. Grow up and take your lumps. "Goonswarm Federation has existed for a decade. The Imperium has existed for half a decade. We have built, we have laughed, we have cried, we have marched to war, we have lost dear friends. We are deeply invested in the wellbeing of the whole because we comprise that whole. We have raised hundreds of thousands of dollars for charities, we have raised the visibility for any number of individuals and issues, we have helped our people in uncountable ways. This rock solid commitment to our own ideals and to the community we’ve collectively built means that when I inevitably find myself in the trenches or in dire straits, I have but to look to my friends standing next to me. They have my back and I have theirs—not because of self-interest, but because they would do the same for me." Talk about exclusive. When Sion talks about "community" he means Goons. Which is fine I suppose. Lots of us have communities like this in Eve. Alliances. Corporations. Podcasting crews. Any group of like-minded players gathered together could be considered a "community". Although I don't think anyone in their right mind would consider people who post to Reddit or other forums a "community". I mean its just a place for people to comment and post, you know, like Facebook. Oh wait, Sion thinks people consider Reddit a community. He must, since he spends about two entire paragraphs trying to prove that it isn't. I did it in two sentences. Having said all that, Reddit is part of "the community", something that Sion fails to grasp. Frankly no one speaks for "the community" and anyone who says they do should be scorned and mocked openly. The only community I can speak for is the players in my own Alliance and in Stay Frosty. Otherwise I'm just a rather handsome and super creative blogger type person. Whenever I use the words "community" I mean that vast, unwashed totality that includes everyone that has anything to do with Eve Online. All of us. Y'know, the same bunch of lunatics that said no thank you to the Kickstarter. For reasons. If these guys are seriously going to try this again in March, they are going to have to come to terms with the fact that the community is bigger than Goons. Or not. And if I addressed anyone in my Alliance as "My People" they'd put me away. It's a game people!! Lighten up. 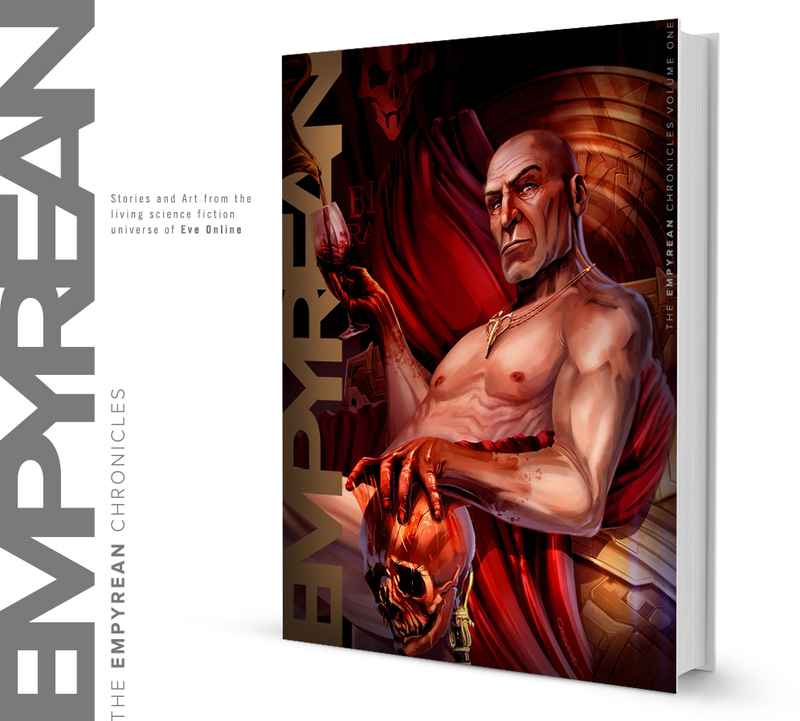 Special thanks once again to Gabriel Cassata for agreeing to provide the amazing cover art for our first volume. Submissions have been pouring in and we have right around 25 writers for Volume One. Just as a reminder, there will be other volumes, the Dec 12th deadline is only for Volume One. Any additional submissions will be considered for future volumes. Heck, even some of the submissions we already have might find their way into future volumes. We haven't gotten that far yet. If you have submitted a story or two and haven't heard from me yet, do not panic. I'm still building the editing documents and will be getting back to everyone. The essential point is that we are compiling right now and one of our esteemed editors will be getting in touch with you within a few weeks. My personal goal with this project is to provide an exceptional and professionally designed, edited and illustrated collection of fan fiction and art for the Eve community. At zero cost. Believe it or not, this project's roots go back almost three full years and it has simply taken me this long to get around to doing it. My ultimate goal is to get the community excited about the talent we have on hand, and to generate interest in providing these volumes on Amazon as eBooks. I make no bones about that. Whether that happens or not is entirely up to you dear reader. If you enjoy the stories and the art then let CCP know. If the demand is there, then we can move forward. If not, then I'll keep doing them as free PDF downloads. Entirely up to you. That is the power of this great community of ours. I'm excited about working on this and look forward to reading all of your stories. We still need artists, so if you are interested please let me know. I've decided that the free PDF version of the book will be made available in traditional 8.5x11 letter format at both print-resolution and screen-resolution versions. Just in case anyone wants to print out a hard copy for themselves. Today's post comes from the world's greatest CSM candidate and the man most deserving of being YOUR representative in this once esteemed council - Joffy Aulx-Gao. Recently a lot of distrust and bad relations have developed between the CSM, CCP and the player base. The CSM leaks like a sieve and rumblings have developed that wonder if we even need a CSM at all? So what can be done? It is easy to say the CSM needs more integrity. But specifically perhaps one way to solve this problem is taking legal action against those that breach the NDA. Currently breaching the NDA is without real consequences except being kicked from the CSM, perhaps we need to re-establish trust between CCP and the player-base. Most companies do something similar and CCP would not be that different if they enforced the NDA more strongly. The consequences of this can be big and devastating for all of us. The CSM might end up being shut down or changed because without trust the CSM is useless, can’t give feedback, doesn’t know what to ask the community, nothing. With no CSM how will we give feedback and suggestions before the ideas are thrown out to the masses? In EVE it’s very beneficial to have a group of players that really knows the game and can "foresee" what will happen with certain changes. In my opinion we need to maintain the CSM. I plan to do my best to get into the CSM but if it fails or CSM is disbanded I will offer to help CCP to make EVE more accessible for disabled even if I have do it by myself. CCP has given me so much joy, happiness and friends, it’s about time I give something back to CCP. If I am fortunate enough to be elected as your representative to the CSM I will bring integrity, honor and hard-work back to the council. This is my promise. 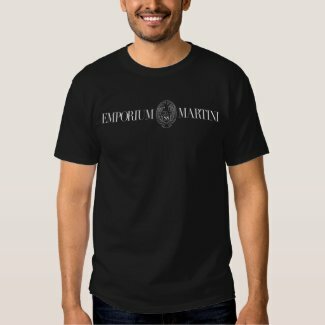 A note for my European and overseas readers, there is a Zazzle International website with better shipping costs. From what I've been told if you change the .com to a more local designation you get specific country versions of the store with significantly lower shipping prices. From what I've tried so far this has been true. And no, I have no idea what the letters WCS stand for. Could be anything. But whatever it is, it must need to be banned before another kitten dies. 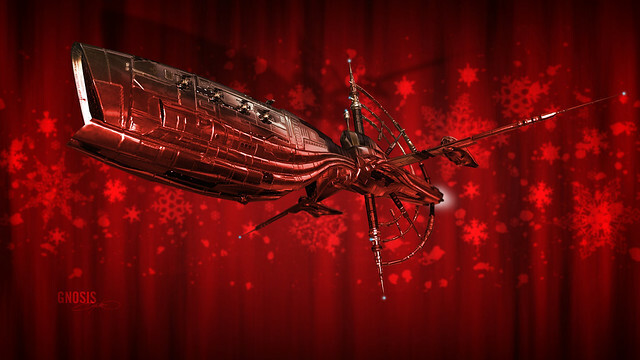 Johnny Pew takes a look at the 13 NEW Ships we'll be getting next week! I'm out of the studio until late tomorrow, so until then - Stay Frosty! 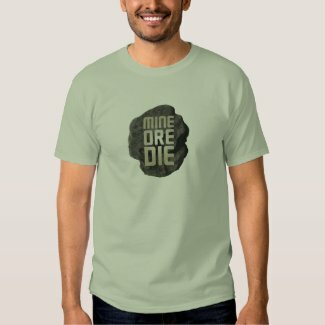 Rockhound Pride and the backbone of industrial might, share your love of endless hours of rock pew-pew with this glorious MINE ORE DIE shirt. Let everyone know you got rocks in your head! I decided awhile back that since CCP won't allow me to create and sell t-shirts featuring Eve art, that instead I'd start to create what I'm referring to as "meta art" shirts to offer the community. 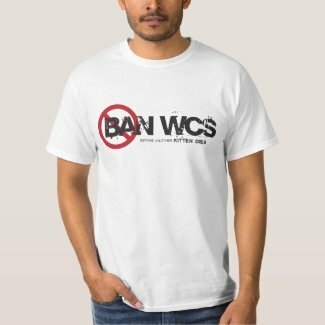 Careful not to include any Eve related IP issues, these Meta products will be popping up whenever I feel inspired by the good people of our community. In addition, if anyone is interested, I'm also willing to offer related products inside the Eveoganda store - like podcasts, Alliance or Corp logos, charities, or anything else related to community interests. If its for a charity all proceeds will be returned directly to that charity, so contact me about setting something like that up if you are interested. And yes, I understand this is me potentially making a few bucks. 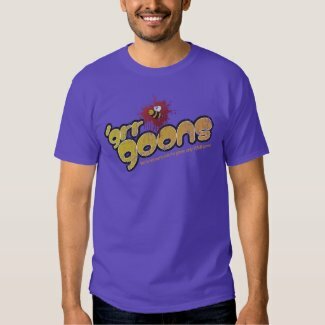 The store has been up for three years now and I've yet to see a royalty check from Zazzle, so I don't think I'll be retiring anytime soon. If you have an issue with it, please do not spend your hard earned cash on my behalf. Spend it on your Eve subscription, please. Or posters! Those are also very nice. On November 23 on the Emporium forums (which is not like r/eve AT ALL! ), Mittens, alliance leader of Goonswarm Federation, The Emporium coalition and Kickstarter genius, announced plans to create a super-dooper RMT empire in New Eden. His plan, which was laid out to all members of the Emporium, is quite simple(duh! ): Bend the knee and enjoy the benefits of shopping at The Emporium, or be evicted and replaced with someone who will. This message was quickly passed around Reddit (to much lolz), but has now been made official as of November 30. SALE! SALE! SALE! Oh, sorry, we meant content. What else are we gonna do? And NO Book DAMN YOU ALL! Stoopid community! Discounted Subscriptions to TMC™ Feeds! Intel and Connections™: We'll share our sekrit pony list™ with ya. Like it or not, Mitten's is getting a new pool. With The Emporium's current campaign in the evacuated region of Cloud Ring, we may see this plan put into action a lot sooner than later. Spring is Coming!! We're also happy to reveal the NEW Viceroy Program LOGO! !